One of the 52 “hukams” or orders of Guru Gobind Singh Ji says “kirt dharam di karni” .. Which means, we must earn a living by doing whats morally and ethically right and abides by our religious teachings. 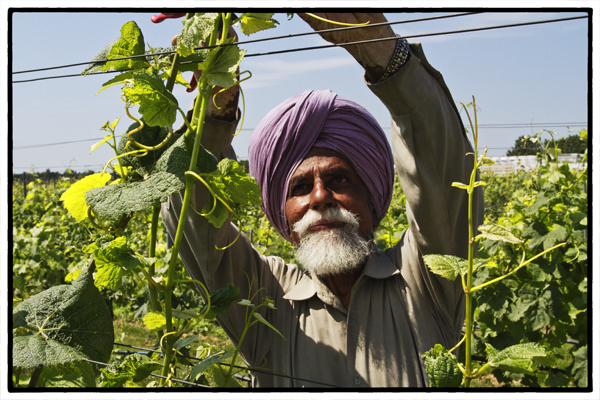 Since we are strictly prohibited to consume alcohol or any other intoxicant, I dont think it makes sense for a Sikh to work in a vineyard, as it offends the principle of “kirt dharam di karni”. I like to thank the author for not hesitating to ask a question that he is not familiar about rather than just assuming so kudos! The reasons sikhs are farmworkers or do not seem to be affected by heat is because in India – farming is most prevalent in each family and if you have ever been to india you would know the heatwave in india is much worse and hence they can withstand what we Canadians call warm weather – easily. Being farming is primary occupation and grapes can be used to make grape juice or eat as a fruit, i do not think there is anything morally or ethically wrong with sikhs working at vineyards – it is a form of harvesting and related to farm work. I agree with you as Sikhs we are not allowed to do drugs, smoke,drink – these are key principles of their faith, and i appreciate you being perplexed as to how come they are working in scorching heat, but in my view i think it is permissible and a honourable job as anyone can attest to working at a farm is no easy feat!